Yeah, yeah, I know I’ve been mentioning Romania a lot in my posts recently. The girls left six months ago April 5, and for some reason I’ve been missing them this week. This is a really good link though – lots of good pictures of Romanian architecture and historical buildings to look at. Yet another reason why Romania is better than us: They went on Daylight Savings time effective today, whereas we’re not there for another week yet. Looking forward to it being light outside until 7:30. I hate winter and am ready for it to be over. My blog and everything will still be here – I’m not moving the entire operation over to MySpace. But I realize that a lot of people use it for networking, and I figure it might be worth it to have a presence there, if only to direct people to my blog here. So if you’re on MySpace, check out my page, and add me as a friend if you want. Currently my only friend on that site is some doofus named “Tom” who is apparently put on everyone’s friend list when they sign up. Woohoo! My Google AdSense revenue has ballooned to over two bucks on my first day! Guess I can afford that down payment for a condo now. Friday night – time to go visit my mug at the Tap Room. See you later! – I have a friend looking for a job as a dental assistant… so I figured I’d use the Power of the Blog to see if I can help her out. She can do receptionist work, or actually assist (hold the suction, things like that – but not a hygenist). She’s a hard worker and is very friendly and sweet – I think she’d get along well with patients. If anyone knows of any openings shoot me an e-mail (paul@paulryburn.com) and I’ll pass the info on. Thanks. 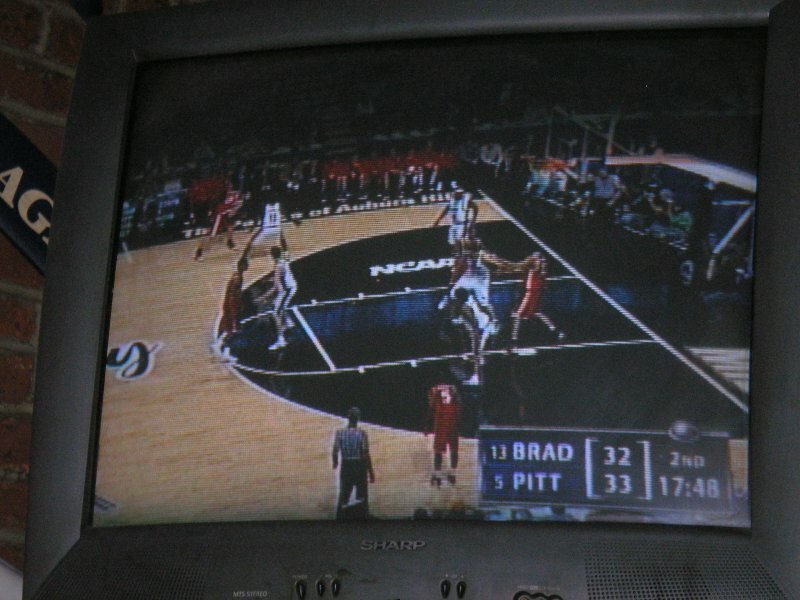 – So last night I went to the Saucer to watch the Memphis-Bradley game. Took a seat near the pool table (good view of the big-screen TV, and more importantly, good view of the waitresses). Met a guy who manages rental properties who needs a website done. I gave him my contact info and we made plans to talk soon. Very cool… consulting work just seems to be falling into my lap these days. – Two weeks until the new job starts. I’m thinking how nice it will be to have an entire hour for lunch in Midtown. So many good places to go. Cooper-Young, which will be about 2 minutes away from where I’ll be working, has lots of options. Looking forward to a pita sandwich at the Deli and some of their delicious fries… and I’ll finally get to go to Casablanca. It’s been open almost a year and I haven’t been there yet. Haven’t been to Do for sushi yet either – is it open for lunch? I’ll also be two minutes away from Overton Square… which means I can get a slice of supreme at Memphis Pizza Cafe… catfish acadian at the Bayou… and a little farther down the street is the MONKEY!!! I hear they have the downtown Blue Monkey menu at the midtown location now… Hot Wing Egg Rolls!!! Woohoo! And further down the street there’s delicious Italian food at Fino’s… and if I drive a mile or so further still, there’s Vietnamese food at Saigon Le. People who live and/or work in Midtown… what are some other good lunch spots? – Looks like I may be going to a silent auction tonight presented by Lantana Projects, a nonprofit that offers a residency program for international visual artists, and develops the culture of contemporary visual art in Memphis. I responded to the person who invited me to the auction with the following e-mail: “I’ll go if I don’t have to wear a tie.” Here’s a link to info about the silent auction. DJ Buck Wilders will be spinning Memphis soul and R&B, which should set the tone for a fun evening. – My mother e-mailed this morning with a good link: Zillow.com, where you can type in the address of any house, and find its appraised value and the values of the other homes in the neighborhood. This site helps keep real estate agents honest, and lets buyers know if they’re overpaying. Thought I’d post it since I know at least one of my blog readers is shopping for a house. – As you can see, Google ads are now appearing on my blog. I enabled this option, decided to give it a try. Here’s how it works: People click on the ad links -> I get money. Since they approved me to host their ads about 10:00 last night (before that it was displaying public-services ads which didn’t pay out), I’ve already earned a whopping 16 cents! Woooooo! We’ll see how the ads go for a couple of weeks. If they get annoying I’ll take them down. I kinda like the concept of “do what I’d normally do anyway, and get money for it” concept though. True, I’m whoring myself out for cash, but I already do that 8 hours a day anyway, so what’s a little more. At least this income stream doesn’t require me to sit in a damn cubicle. – I’m extremely annoyed with the Tap Room right now, because they removed the video game machine with “Gone Fishing” on it. (That’s the game where fish jump out of an icy pond and a polar bear hits them with a bat. Best game ever to appear on a video crack machine, by far.) That probably won’t stop me from drinking several mugs of PBR there this weekend, though. – Just looked at my website tracker to see what kinds of Google searches are leading people to this blog. Someone searched for “carmel tube top.” That’s pretty funny. – All right, off to work, where I’m helping a heating and air conditioning company get in the Guinness Book of World Records in the “Most Confusing Rebate Program Ever” category. 8 hours in the f***ing cubicle and it will be time to start drinking! – I’m hungry for lasagna today. When I was teaching at the U of M in the late ’90s, one of my students felt sorry for me because I didn’t have a wife or girlfriend, and brought me a pan of homemade lasagna – the best I’ve ever had. She used real ricotta and mozarella cheese, and sausage rather than just plain old ground beef. I have yet to find an Italian restaurant in town that even approaches that incredible lasagna. But, there are a lot of Italian places I’ve never tried. Any recommendations? – Maybe I can convince one of my neighbors, who recently proved her ability at cooking Italian food, to give lasagna a try. – There was an article on the Memphis Business Journal’s website that the crawfish harvest is about 30% of what it was last year. I hope that doesn’t negatively affect the two local crawfish festivals, which are both coming up. The midtown one usually happens the first weekend in April, and the downtown one, the third weekend. – The Memphis in May Music Fest line-up has been announced. Here it is. – Every year, Memphis in May honors a particular country, and holds international-themed events the week between Music Fest and BBQ Fest. This year’s honoree is Costa Rica. I need to lobby the Memphis in May organization to select Romania as next year’s country. One of the top Memphis in May people has a plate on the wall at the downtown Saucer, and if he hung out there at all between July and October of last year, he may already be familiar with what a wonderful place Romania is. – And speaking of Memphis in May… kind of early to announce this, but since I’m on the topic already… I’m accepting invitations to tents at BBQ Fest. E-mail paul@paulryburn.com to respond. I’m not ashamed to use this blog for personal gain. I’ll probably repeat the announcement a few more times between now and mid-May. – NCAA tournament tonight: (1) Memphis vs. (13) Bradley. Estimated tip-off is 6:27 pm. I’ve got an appointment to get a haircut after work, then after that I’ll probably head to a bar and watch the game. Probably I’ll be at the Saucer, unless I don’t like the beer they have on Fire Sale, in which case I’ll be at Sleep Out’s. – And that’s it for now… time to fulfill my ultimate purpose in life, which is of course sitting in a cubicle all day. Back tomorrow, unless I have a heart attack and die from all the excitement. Tangophilia will host a four-week Foundation Series of classes in Argentine Tango, to be held at Quetzal on four successive Mondays, April 10-May 1, from 6:30-8:00 pm, with guided practica afterward. Early registration fee is $50, $45 for students. If you can’t make the April schedule, they’ll repeat the Foundation classes in May. For those of you not sure if you want to commit to the four-week series, you can try it out for one night at Harbor of Health on Mud Island, where they will be having a one-night introductory lesson (“tango in a nutshell”) this Friday, March 24 from 7-8 pm. I’m not saying that I will be there for these (although I haven’t totally ruled it out). Just wanted to pass the info along for downtowners who might be interested. Thinking back to that job offer I got last week… the entire reason it fell into my lap was because I had a resume on my web site. Very few people have their resumes online. Because I did, the staffing agency working with the City Schools found me when they were struggling to find qualified candidates. So in a sense, I made my own luck. Everyone should have a current resume online. Even if you’re not actively searching for a job, you should put a resume on the Web anyway. You never know when a better job will find you. Being more visible than everyone else is a key to getting ahead in your career. Not sure how to do it? Three steps. 2) Upload your resume to the Web. If you pay for Internet service (dial-up, cable or DSL connection), your provider (ISP) may provide you with free web space for personal pages. If not, you can use Geocities or some other free-hosting service to put your page up. 3) Go to Google and submit your resume web page for indexing. Once Google’s robot takes a look at your page and indexes it, your resume will be web-searchable. – Be sure to include all keywords that are relevant to the position you want. For example, if you program in Visual Basic.NET, make sure that phrase appears on your web resume. If the keyword has an abbreviation (e.g. VB.NET) make sure that appears too. – If people are looking for resumes, the first keyword they will probably specify will be “resume.” So make sure that appears in the title of your web page. For example, “Resume: Paul Ryburn”. So that’s the unsolicited advice for this evening. Be visible. Get noticed. Let opportunity find you. – I was just flipping through the Flyer and was sad to find an auction notice, auctioning off everything inside “the building across from the Tennessee Street Brewery, at 11 E. Butler.” I quickly realized that they meant the Butler Street Bazaar. I wonder if that means it’s not going to reopen? The Bazaar was a place where independent vendors and artists could rent a booth for a minimal fee, and have a space to sell their wares. They also had food vendors, a farmer’s market, and bands on the weekends. They shut down in fall ’04 with plans to reopen in 2006 after doing some remodeling. Now I’m wondering if those plans have been scrapped. The only thing wrong with the Bazaar was that it was a few years ahead of its time, opening in 2001 when there weren’t yet a lot of people living in South Main. If it had opened a few years later, I have a feeling it would have been a huge success. My best wishes to the people who ran the Bazaar, who were honest, ethical people with a strong sense of community. – All right. On to happier things. I went to the Beale Street St. Pat’s parade on Saturday, where fellow blogger Kat was riding in the Ptolemy Krewe float and promised to toss me some good beads. And when she saw me, she pulled off a green strand with a shot glass medallion and threw them my way – but somebody else caught them. Oh well – before the parade, she said that if I didn’t get any beads, she’d give me a peek at “the girls” sometime as a consolation. (“The girls” is her nickname for her breasts.) Ya think maybe I missed that catch on purpose? – I did catch some beads from the Boll Weevils later on. 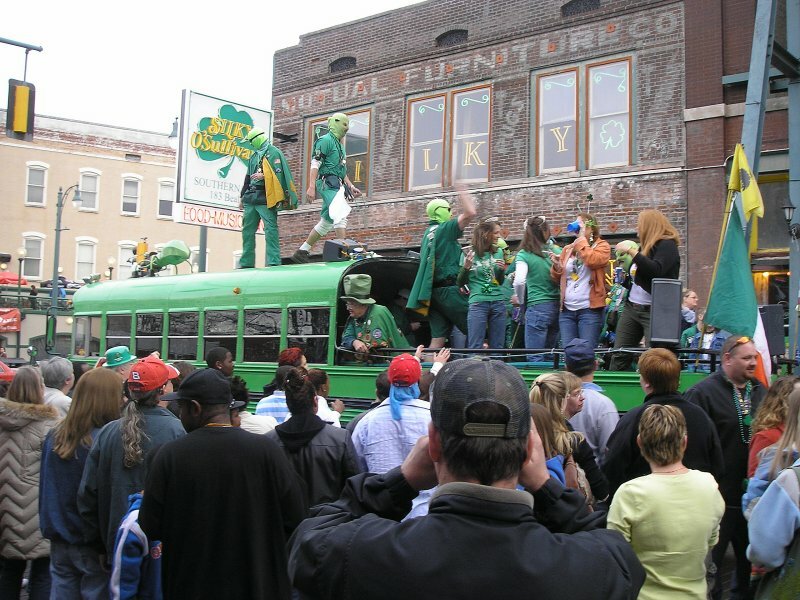 You haven’t really lived in Memphis until you’ve caught at least one strand of beads from the guys in the big green bus. – The word on the street is that the Majestic, the restaurant on the Main Street Mall that will take the old Gordon Biersch spot, will open April 10. I ran into someone who got hired as a server there, and she seemed quite happy – looks like they’re going to treat their employees a lot better than most downtown bars and restaurants, not that surprises me considering who will be running the place. Good luck to them, and I guess in about 3 weeks I’ll have yet ANOTHER bar to sit at. – Speaking of bars… it’s Pint Night at the Saucer, so I gotta cut this short. This will likely be the only weeknight I go out this week, as several of my business projects are nearing fruition and I’ve got to get them done by month’s end. Back later with more blogging!